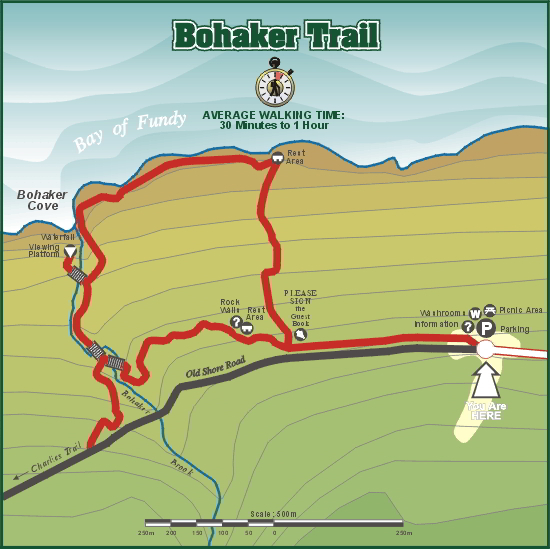 One of two trails making up the Delaps Cove Wilderness Trail, this trail is named for its proximity to Bohaker Brook, which, in turn, was named for an early landowner. The trail will take approximately one hour to hike. Visit the 43 foot waterfall at Bohaker Cove and view the basalt lava rocks that can be seen on the cliff from the viewing platform. A multitude of plant species grow in the woods along the trail. The ground cover includes the broad or large-leafed aster, bunch berries and many species of ferns. Nova Scotia's provincial flower, the Mayflower, can be found in hidden patches along the trail in the early spring. Cranberries grow along the shore; from the leaves of seaside plantain come marsh greens; and seaside Dulse is another good source of vitamins and makes a healthy snack when dried. The Municipality of the County of Annapolis does not constantly supervise and/or maintain the trail system and assumes no responsibility for the safety of trail users. We recommend that users stay on the trails and be wary of the uneven trail surface and nearby cliffs. Children should be closely supervised. Please exercise safe outdoor recreation practices and always remember to tell someone where you are going and when you expect to return. Hunting is a popular activity in Nova Scotia. Please remember you are hiking in a wilderness area, and wearing "hunter orange" is advisable during hunting seasons (September to the latter part of December).